However, there are some people who genuinely want to do better but their environment is a barrier preventing them for achieving good health. Did you know that your zip code may increase your risk of stroke, high blood pressure and other types of heart disease? Yes it is true, studies show people living just five miles apart can have a difference in life expectancy of more than 20 years. 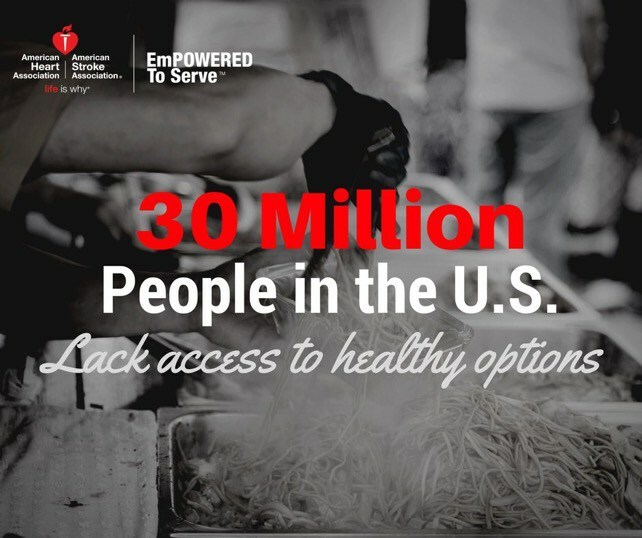 It’s a disheartening fact and an unfortunate truth that inspired the American Heart Association’s EmPOWERED To Serve movement. The initiative aims to promote healthy living and well-being in urban communities by bringing change and addressing key factors that impact health including: economic stability, education, societal influences, housing and access to quality healthcare. In hopes of examining the root causes that impact social determinants of health, the organization is hosting the EmPOWERED To Serve Summit, October 17 – 18, at Galludet University in Washington, D. C. Experts and thought-leaders from around the country will facilitate conversations and sessions on: Equity First Policy Platforms, Corporate Social Responsibility, Conscious Capitalism, Building a Culture of Health on College/University Campuses, and many more. One of the most exciting parts of the summit is the Urban Business Storytelling Competition where 10 finalists will present their innovative, clearly-defined urban business solutions to address barriers to sustainable healthy living. It's awesome to have sessions about these topics to help spread awareness so people can become interested in advocating for these issues but implementing solutions provides us with actionable items that we can use to make an impact. Talking is worthless without action. These 10 finalists were selected from 128 submissions! Three winners will be chosen to implement their plans in their selected community and will receive financial awards ranging from $10,000 - $30,000 to implement their plans. Check out their proposals here and tune in to EmPOWERED to Serve's Facebook live stream event on October 17th at 7pm to watch the competition and vote! Now It's Your Turn: What are some environmental and external factors that impact the health of people in your community? Do you have any suggestions on how to change it? Comment below to let me know; I would love to hear what you have to say. Disclosure: Thank you to the American Heart Association for sponsoring this post. All thoughts and opinions are my own. Thanks to my #ResilientFamily for supporting the honest brands that make DDA possible!